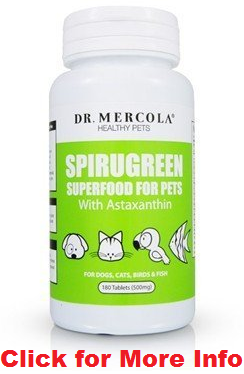 SpiruGreen for pets is the most complete spirulina supplement for pets on the market. It receives great reviews from pet owners of all kinds, including me. Why? Because its a product that performs as its supposed to. SpiruGreen contains 2 types of algae, spirulina and haematococcus microalgae. Spirulina is the main ingredient by far, but haematococcus microalgae is a great addition. Both are scientifically proven to have many benefits. Spirulina is the most nutrient dense natural food there is. Per weight it has more protein, iron, and beta carotene than any other food. It will boost your pet’s immune system and lead to a healthier coat and skin. Haematococcus microalgae is one of the best sources of astaxanthin on the planet. And astaxanthin has a number of benefits including neurological, cardiovascular, immune system, joint, and all around health and longevity. If you are buying this for any pet other than a dog, then I can’t help you here. But I can say for my dog its not very difficult. He’s not a picky eater to begin with, so that helps though. But I feed the tablets to him with many different foods. Meat, treats, etc. I just hide the tablet(s) and I don’t think he even pays attention to how it might taste different. Is SpiruGreen worth it for your pet? After taking spirulina myself for a while, I knew I had to get it for my dog when I came across this. Much of the benefits are the same for dogs, cats, and other mammals, as they are for people. My dog is still young so he doesn’t have any health issues that I know of. He was already extremely energetic, had a nice coat of hair, and just looked all around healthy. So I don’t really know if it has improved his health yet. But I know its capabilities, so at the very least I wanted to start feeding SpiruGreen to him for preventative reasons. So that he doesn’t get unhealthy in any way. If you want to find reviews from other customers you can read them here. There are plenty of reviews that swear SpiruGreen has improved their pets condition. SpiruGreen is an all natural, multivitamin you could say. And natural in this case is better than synthetic. This product lives up to its claims and can improve your pets all around health.